And no, we didn’t eat them. They were cooks and bakers, and they provided meals of a (more or less) authentic nature. For instance, there were no potatoes, but we did have marinated turnips. Whole grain breads, and porridges and stews. That sort of thing. 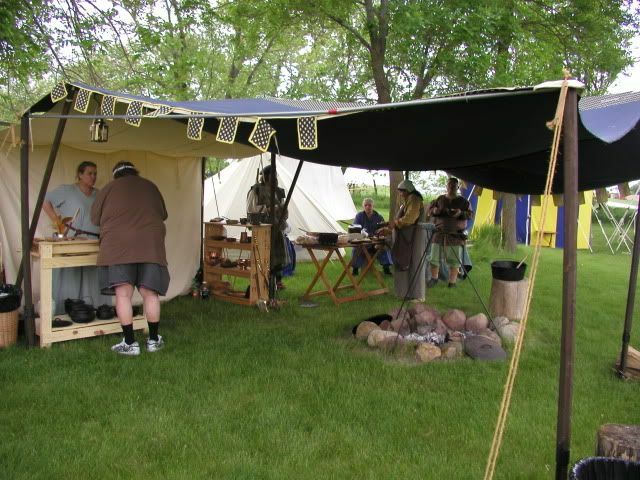 The last day I was there, the cook (who dressed in a Scottish kilt, also anachronistic—even in Braveheart), made haggis. I was curious, and took a fair portion. Haggis (I’ll spare you a Wikipedia search) is a traditional Scottish treat made of organ meats from a sheep, mixed with oatmeal and stuffed in a sheep’s stomach, like a sausage. It tasted to me like a kind of liverwurst porridge. I’ve eaten tastier things, but it wasn’t awful. However, what we had wasn’t “proper” haggis. The cook hadn’t been able to procure any sheep parts at all, so he’d had to substitute a portion of a cow’s stomach, along with pork heart and liver. My friend Ragnar, who’s had haggis before, said the real stuff tastes slightly different, though he liked this well enough. So I’ll have to have a proper haggis someday, to see what it’s really like. I’ve heard haggis can be pretty rough from the hands of some cooks. Course, you’re probably familiar with things just as bad from the Norse menu. Actually, I think I read somewhere that food historians now think that haggis originally came to Scotland with the Vikings. Another vile ethnic slander, I’m sure. And no, we didn’t eat them. Nice. The best humor is unexpected. By the way, why does it say “Bloogroll” over in the right column? You, sir, are a brave man. I didn’t touch haggis when I was in Edinburgh a few years ago. Nor the deep-fried pizza or Mars bars. Come to think of it, I’m not sure how I maintained adequate nutrition during that visit. I’ve heard haggis joked about all my life, but personally I have trouble being very frightened of anything that’s mostly oatmeal. I didn’t know it was mostly oatmeal. That doesn’t put a different spin on it. I read recently that a festival somewhere had deep-fried Oreos. I can’t remember where. I’d go to kettle corn over that anyday, and I love Oreos. So, which is worse? Haggis? or Lutefisk? I’d put ’em about equal. Both mildly unpleasant foods that I’d be willing to eat in moderate amounts for the sake of getting along with people.